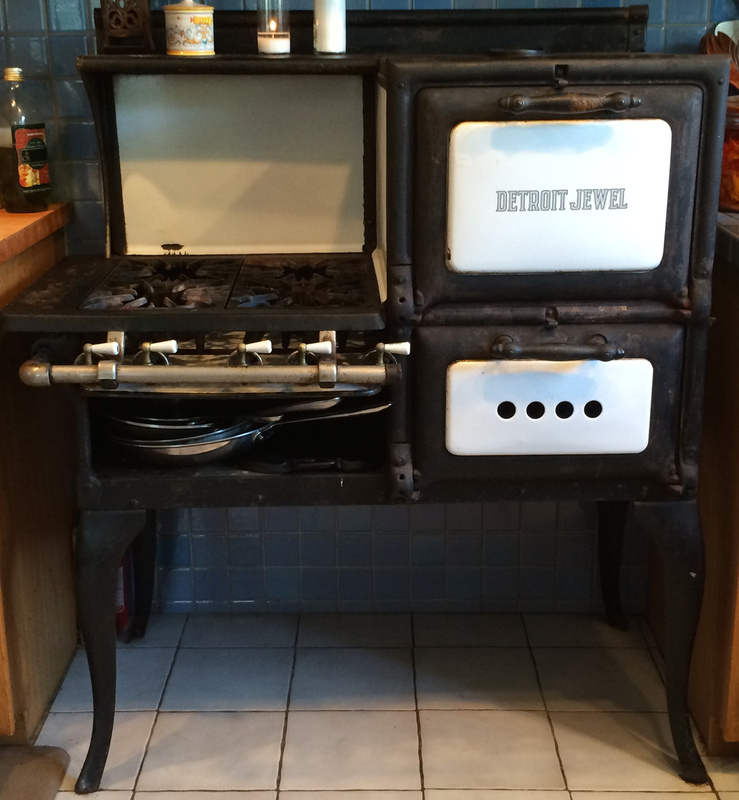 In August, we sold our 100 year-old Detroit Jewel gas cooking stove. My dad bought it at a swap meet in 1972 and not quite knowing what to do with it, gave it to me. When I got it, it was little more than a rusted out hulk and a box full of parts. I gave it a new coat of high heat black paint, cleaned the rust off the cast iron burners, polished the brass valves, bolted it together, and brought it back to life. I have used it as my kitchen stove ever since. I moved it to New Hampshire and back to LA in the mid 70’s, and for the past 30 years it has been a stalwart companion in our home in Venice. Thousands of wonderful meals have come from its 4 star-shaped burners and its temperamental oven. Jake learned how to cook on it as a very young boy, we used to cook together on it, Terry and Jake would bake together in its cranky little oven; there are many stories of his adventures with the Jewel. 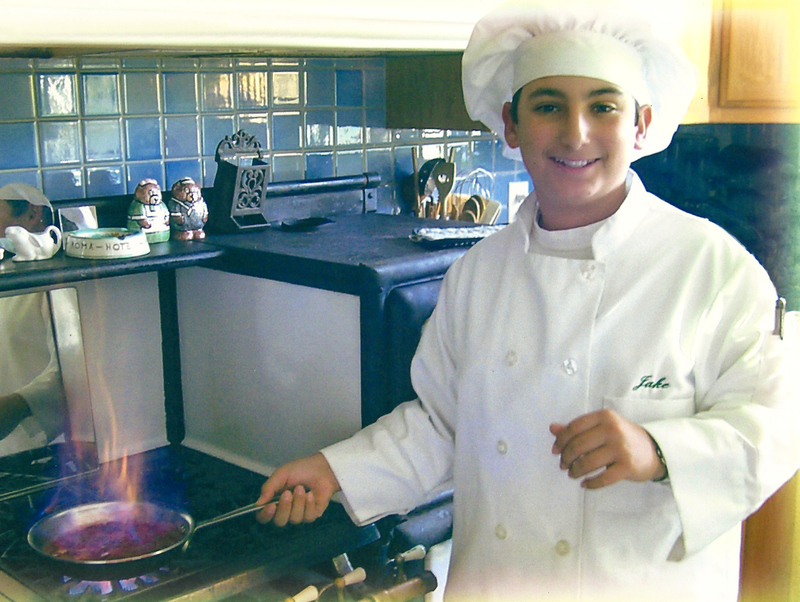 He posed in front of it for his 6th grade graduation picture, happily flambéing strawberries. In some odd way, that stove was part of our family. The past couple of years, it finally started to truly show its age. The interior of the oven began rusting through, and even though it still worked, it was time for a new range. I didn’t just want to cast the Jewel out, and put it up for auction on eBay as a “Local Pick Up Only” item; after all it weighed close to 100 pounds and I couldn’t imagine shipping it anywhere. Once the auction ended and the stove sold, I got an email from Karen, the buyer, asking about shipping the stove to Manila. Yes, Manila in the Philippines. She had seen it online, had fallen in love with it, and wanted it as a centerpiece for her new bakery shop. We corresponded back and forth and she arranged a shipper to come and crate the stove for its long journey. We carefully packed it in bubble wrap and cardboard and strapped it up securely. I bid farewell and watched somewhat wistfully as the van drove down the street and turned the corner. Today I got three emails from Karen. One letting me know it had arrived safely, one with some photos of the stove in restoration, and one with a very moving story about her business, a tiny glimpse into her life and a passage from the prophet Isaiah that brought me to tears. She knew about Jake, and in fact sent us a very lovely book, One Thousand Gifts by Ann Voskamp, in August immediately after finding out about him through this blog. Here’s the thing. I don’t really know Karen, have never met her, most probably never will, but she is one of those extraordinary, compassionate people we have encountered while on this journey. I am reprinting her message as it speaks so eloquently about loss and renewal. In 2011, God allowed my business to be removed from my hand. I struggled with pain, loss, and grief. I lost my interest to work and was barely treading water. A lady I met in 2012 suggested that I improve my shop. It didn’t really touch me as I felt removed from my business. 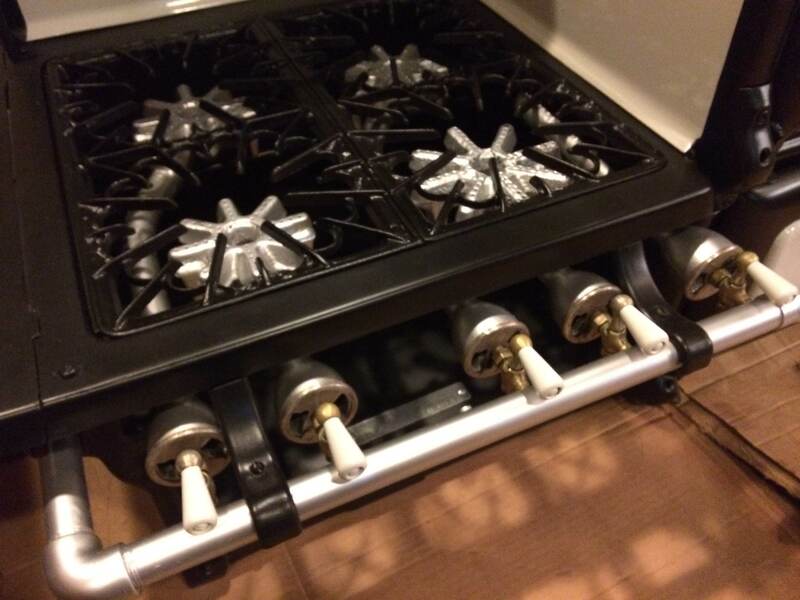 In mid 2014, she gave me the idea of a vintage kitchen so I scouted the Internet for an old stove. I saw your Detroit Jewel. When I was able to buy it, it started getting my mind rolling about how I would make everything else go with it. When I went to the US and Canada in August to take my kids to university, I started looking for accessories to match. When I came home, I realized that what I bought was too much for the tiny shop I have. I was motivated to look for my long overdue bigger shop north of central makati. I found an old house I could rent much cheaper in a location that I like. And that old house looks like my company logo. I finally signed the lease just last week and THAT will be the home of your family’s Detroit Jewel. By the end of this week we will start fixing up the place. The ceiling and floors and many things are broken that need to be fixed. I can’t wait to open up the new Karen’s Kitchen shop, Lord willing, in February. The sight of the Detroit Jewel reminds me of how what is broken can be restored. planted by Adonai, in which he takes pride. Just wanted to share with you my thanksgiving for sharing a part of your family with me through your Detroit Jewel. Kinda out of the blue, but so amazingly appropriate. We have truly been “bound in the dark”, have been given ashes instead of garlands, and still have a “heavy spirit”. We can only hope for the “oil of gladness” and to be “let out into the light”. I feel like an ancient ruin in need of rebuilding. They are out there in the world. Utter strangers who can uplift you with a word, a glance, simple kindness, a touching gesture from their heart. That is the real message from Manila. These are the people who help carry you along this perilous, heartbreaking journey. Friends who stand by you without judgement, without telling you how you should act or when you should do this or that. People who will help you rebuild your life. People who will comfort you in mourning. There are people I have met through this blog, fellow travelers who are becoming friends too. There are people with whom I have forged friendships through other virtual means. People I have never seen or spoken too, who lend their unwavering support to us from afar. We are so fortunate to have these people in our life. Friends who have been there from before the beginning, many have been there from the start of this frightful voyage, some we have just met. I am sure there are people yet unmet, that we will find along the way. Seek out those people; what is amazing is they will often find you, somehow. Surround yourself with people who support you. Run away from people who don’t. Many have found us, and we are grateful for that; we are grateful for them. We cherish them, each and every one. Here’s our message to all of you: We can’t do this without you. This entry was posted in Coping, Food, Friends and Family, Healing, Jake Colman, Kindness, Support, Tragedy and tagged baking, compassion, deathofason, family, friendship, Grief, isaiah, manila, prophets, stove, thanksgiving. Bookmark the permalink. Truely beautiful. Your Jewel has brought you one called Karen. is a visual aid for restoration not only for me but to the people who will know its story. I am so touched to take a small part of it. I am awed by how a simple mundane transaction such as getting rid of an old stove on your part and buying a stove for my shop could be used by God to plant seeds of healing for “two birds with one stove”. I am praying for you both for God’s continued healing, freedom, light, favour, comfort, provision, gladness, praise, rebuilding, restoration. If it is alright with you, I would love to hear about the many stories of Jake’s adventure with the Jewel when you have a chance. I would like to put a little booklet of these stories in my shop too. My friends have nicknamed the Jewel “DJ”. Blessings to you both! We are all blessed to be touched by Karen Young and Karen’s Kitchen creations!